The Sustainable Coffee Challenge has welcomed Tata Coffee as its newest and first partner from India. As one of the largest integrated coffee companies in the world, Tata Coffee puts a strong emphasis on sustainability in the production and manufacturing aspects of the business. The Sustainable Coffee Challenge aims to make coffee the first globally sustainable agricultural product. Tata Coffee plans to share its water conservation and renewable energy management expertise with other Challenge members while also learning from like-minded partners. Tata Coffee operates a freeze dried instant coffee plant that powers from 70 percent-sourced renewable energy. “An integral part of Tata Coffee’s philosophy is sustainable growth, be it for the environment or the communities in which we operate. All our processes and practices are aligned towards globally benchmarked parameters of sustainability. Our association with the Challenge will help us join forces with like-minded organizations in exchanging ideas and best practices,” said Chacko Thomas, Deputy CEO and Executive Director, Tata Coffee Ltd.
Tata Coffee, tracing its roots back to 1922, grows its coffee using sustainable agricultural practices in South India with shade-grown and hand-picked Arabica and Robusta varieties. Rainwater harvesting is part of the growing process, including 273 scientifically designed tanks which store water for blossom and backing irrigation without drawing from groundwater reservoirs. The tanks also cool the atmosphere to sustain the flora and fauna of the area. The Sustainable Coffee Challenge, formed by Conservation International and Starbucks and launched during the Paris climate meetings in 2015, is uniting players from across the coffee industry – growers, traders, roasters, retailers, governments and NGOs. It aims to stimulate greater demand for sustainable coffee while partnering to find solutions to mitigate impacts of climate change and other stressors. 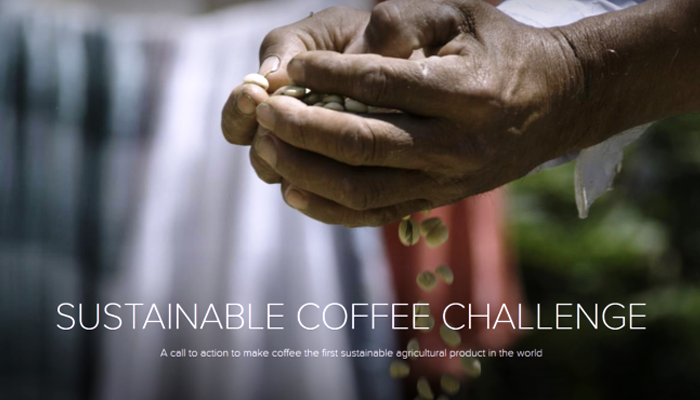 Tata Coffee joins a growing list of partners in the Sustainable Coffee Challenge. Other recent additions include the Government of Uganda and the International Coffee Organization.